The Moon keeps the same side facing Earth throughout its monthly orbit. Both Earth and Moon simultaneously orbit the barycenter (red dot), the center of mass of this 2-body system. 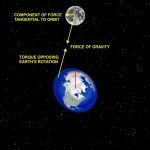 The Moon’s gravity causes a tidal bulge in the Earth (exaggerated) that follows the Moon along its orbit. One orbit of the Moon (one month) currently takes 29.5 rotations (days) of Earth. A planetesimal about the size of Mars collided with Earth around 100 million years after Earth’s formation. The colliding body is sometimes referred to as Theia, mother of Selene, the Moon goddess in Greek mythology. Computer simulations show that with a glancing impact, sufficient debris would be launched into orbit around the Earth to form the Moon. For awhile, Earth had a ring like Saturn. But within less than a year the debris coalesced via mutual gravitational attraction and formed the Moon. You can watch a simulation of the collision here, with not too many ads. Simulations put this young Moon at a distance of about 25,000 km (15,500 miles) from Earth. At that distance it would have appeared 16 times larger than it does today. The Moon’s orbital period (one “month”) would have been only 12 hours. And it was certainly rotating from the collision that formed it, but nobody knows just how fast. 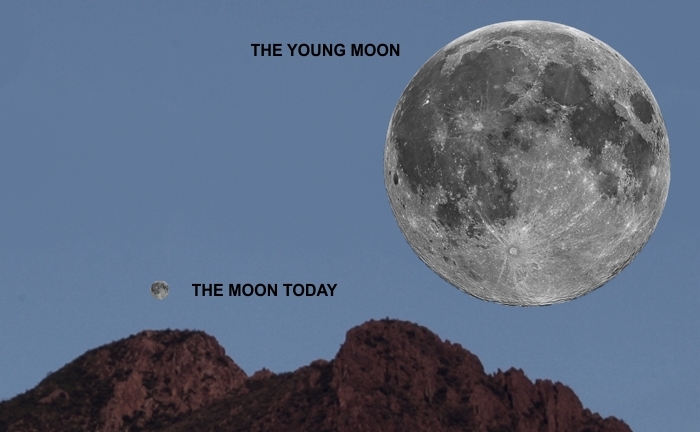 Click on the thumbnail below to see a simulated size comparison of the young and current Moon. The Moon’s distance from Earth is now 385,000 km (240,000 miles), and its orbital period is 29.5 days. It’s also locked in synchronous rotation, which means its rotational period matches its orbital period — this keeps the same side facing Earth continuously. How did this change come about? The answer is gravitational tidal forces. Tidal forces occur because the force of gravity decreases with distance. The Moon pulls on the nearest side of Earth more strongly than it does on the farther side (by a factor of about 4%). This draws ocean waters toward the point on Earth closest to the Moon and creates the tidal bulge. The animation shows that tidal bulge in (exaggerated for clarity). In open ocean the bulge is on average 0.6 m (2 feet). But as Earth rotates its land masses into the bulge (i.e., “when the tide comes in”) local topography can “focus” the bulge to greater heights. The world record is claimed by the Bay of Fundy in Canada, where the difference between high and low tide can be as much as 16.3 m (53.5 feet). There’s also a tidal bulge on the side of Earth facing away from the Moon. At first counter-intuitive, it can be explained in several ways. I like to think of it as the result of the Earth (as a whole) being pulled away from the water. It’s similar to what would happen if you yanked on a basin of water and the water “sloshed away” from the direction you accelerated it. As Earth rotates through this tidal bulge, friction between the water and land slows the Earth’s rotation. When Earth first formed, astronomers estimate the “day” was only 6 hours long. Over 4.5 billion years, that has increased to our current 24 hour day. The rate of increase is now approximately 1.7 ms every 100 years. But there’s more to this tidal interaction. The faster rotating Earth drags the tidal bulge slightly ahead of the Moon. This is not shown in the animation, but it’s illustrated (again, not to scale) in the thumbnail below. Because the bulge contains mass that exerts and feels gravitational forces, a torque is applied to both bodies. 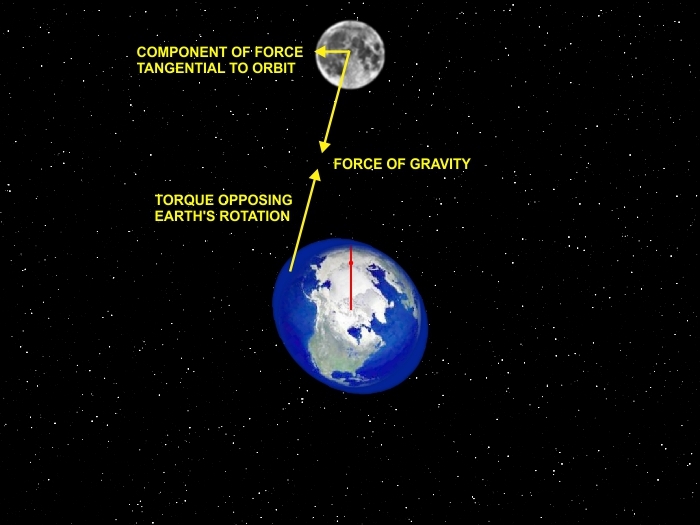 The torques cause an exchange of energy (and angular momentum) that boosts the Moon’s tangential speed and increases its orbital radius. That, in turn, increases its orbital period. 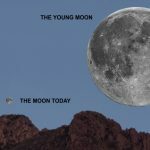 The Moon is currently drifting away from Earth by about 3.8 cm/year. When the Moon’s rotation slowed to the point where 1 rotation = 1 orbit an equilibrium was reached. The Moon was locked into synchronous orbit with its tidal bulge permanently aligned toward Earth. Another way to think of it: The heavier part of the Moon “settled downward” with respect to the Earth. It’s gravitationally stable, like a mass suspended by a rope. Barring some cosmic cataclysm, the Moon will not “start rotating again” as your classmate speculated. Theory predicts that the Moon will continue moving away from Earth until the length of a month = the length of a day. Based on measured trends, this is predicted to occur when the length of a month reaches 47 (current) days, and Earth’s rotation has slowed to the point where one “day” = 47 (current) days. At that point the Moon and Earth would be mutually tidally locked (as are Pluto and its moon Charon). In this far-off scenario you’d only be able to see the Moon from one side of Earth. We would no longer enjoy the spectacle of a moonrise. But by the time this could happen, our Sun will have ended its normal life and swelled into a red giant star disrupting the planetary dynamics of the inner solar system. Chaos will ensue. So to answer your main question: Yes, the ocean tides had something to do with the Moon achieving a synchronous orbit. Lacking any oceans it still would have happened, but over a much longer time scale. The “solid” body of the Earth also experiences a tidal bulge, but it’s only on the order of 30 cm (1 foot). So the same torques would still act on both bodies, albeit more weakly.